In Ndotsheni, South Africa, Stephen Kumalo, a church parson, receives a letter from a minister in Johannesburg, Theophilus Msimangu, telling him that Stephen’s sister Gertrude is ill. Stephen decides to take his money, once saved to send his son Absalom to attend school, and go to Johannesburg to retrieve her. Additionally, he decides to seek out Absalom, who also left for Johannesburg and has not returned or written. Stephen journeys to Johannesburg for the first time, and he is overwhelmed by the experience. He eventually connects with Msimangu and other men of the cloth, where they assure him they will take him to his sister. The next morning, they seek out Gertrude and find her. She agrees to come back with Stephen. Stephen locates his brother John, who has become something of a corrupt bigwig, in order to find out where his son has gone. His brother gives Stephen information about the location of Absalom. From there, they trace his path across Johannesburg. Stephen finds Absalom’s girlfriend, who is pregnant with his child, and learns he’s been missing for days. There is a headline in the newspaper: a local white man, Arthur Jarvis, has been shot and killed in a home invasion. As Stephen continues to look for his son, he is panicked to learn the police are also searching for Absalom, and are tracing the same steps Stephen had taken to try to locate him. Soon, Stephen learns the police have arrested Absalom for the murder of Arthur Jarvis. He goes and visits his son in jail, and is frustrated by the lack of answers. Father Vincent instructs Stephen to pray and rest. The next day, Stephen seeks out the young girl who is pregnant with Absalom’s child. Stephen offers to take her back with him when he leaves Johannesburg. He then visits Absalom in prison, looking for answers still, but gets none. Father Vincent brings a lawyer, Mr. Carmichael, to meet with Stephen. Mr. Carmichael agrees to take on the case pro deo (for God). Meanwhile, back in Ndotsheni, James Jarvis and his wife receive news of their son’s murder. The distraught couple flies to Johannesburg. Like Stephen with Absalom, James struggles with the fact that he never really knew his son, and his son’s life and work was a mystery to him. When he goes through his son’s office, James is struck by his son’s activism and beliefs, and his deep sympathies with the native population. Arthur believed that the native people's way of life had been destroyed by white men, leading to the current epidemic of violence and fear. Soon thereafter, Absalom’s trial begins. The two men arrested with Absalom, including John's son, claim they were not at the scene of the murder. Absalom admits to his presence, but denies he planned to kill Arthur. During the trial, Stephen comes to the doorstep of where James is staying quite by accident, seeking out another missing woman from his hometown. Stephen recognizes James, but James does not know Stephen, and is concerned when the man appears ill and distressed. Finally, Stephen reveals it was his son who killed James’s son Arthur. James assures Stephen he feels no anger toward him. The trial concludes. Absalom is found guilty of murder and is sentenced to death. His accomplices are found innocent and set free. The girl and Absalom are married after the trial. Stephen tells Absalom he has to return home. He, the Jarvis family, Gertrude and her child, and his son’s now-wife all return home. Meanwhile, the late Arthur’s son is visiting his grandfather James, and happens upon Stephen. They speak, and the boy discovers the people are poor and have no milk. Later, a man comes by from Jarvis’ farm with milk for the children. Then a storm destroys the small church. Jarvis sends a man to help the people of Stephen’s community build a dam and improve their way of life. Soon after, Jarvis’ wife dies. Stephen sends a note of condolence to James. James writes back, thanking him, and tells him they are going to build a new church. The day before his son’s execution, Stephen visits James, and then goes into the mountains. There, he waits and prays until dawn, when he knows his son has been killed. Machado, Carmen. "Cry, the Beloved Country Plot Summary." LitCharts. LitCharts LLC, 5 Aug 2013. Web. 18 Jan 2019. Machado, Carmen. "Cry, the Beloved Country Plot Summary." LitCharts LLC, August 5, 2013. 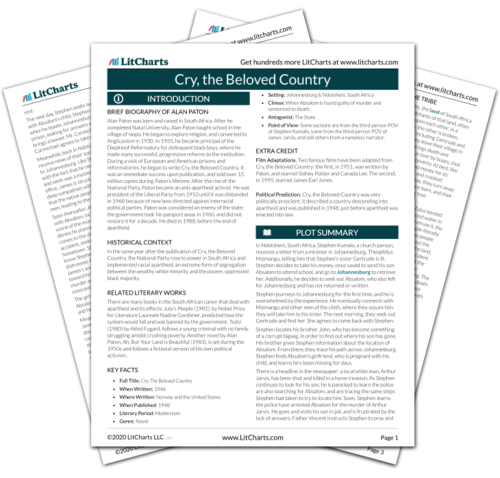 Retrieved January 18, 2019. https://www.litcharts.com/lit/cry-the-beloved-country/summary.